If the printer is redirected, try to install the printer directly on the server where the Service Broker runs. Enable printing permissions for the Run as user for Service Broker service. When printing with a virtual printer, the printer does not open the document after printing. The document does not open after printing if the Service Broker runs as a service. If you want to use the PDF printer for a demo or in case you want to test your label, then you should start ProdumexServiceBroker in console mode. Configure the ProdumexServiceBroker with an administrator user other than system user. Install a PDF printer that allows automatic saving. Configure an output location and automatic document numbering for the ServiceBroker user. Make sure that you configure the PDF printer in a way to show the document after generation. Please note: We recommend to try multiple PDF printers because not every PDF printer is supported. 1. Check whether the correct printer name is set. 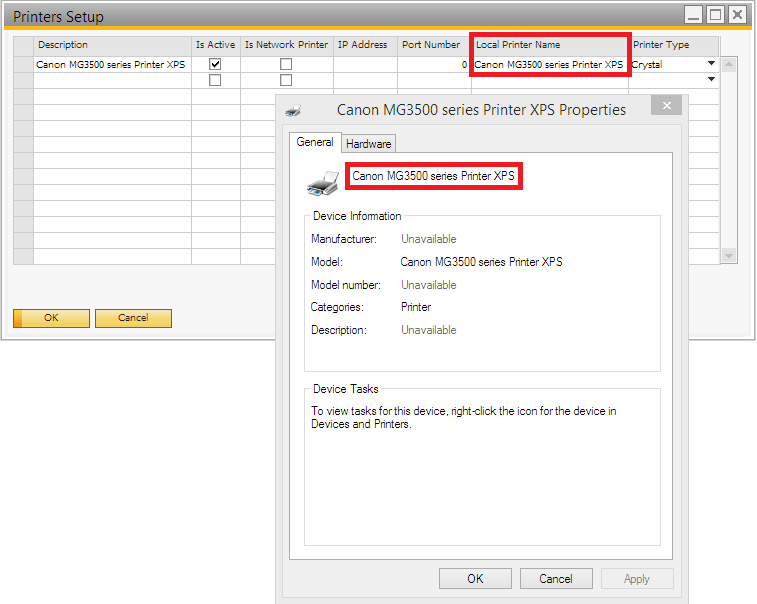 Check the printer settings on Administration > Setup > Inventory > Produmex Scan > Printers Setup. The Local Printer Name must be the same as the printer name in the operating system. 2. Configure the database connection Open the .rpt file in Crystal Reports designer. Print a preview document and change the connection to the right database. Save the report. 1. Check the custom printing settings. Check whether the report was imported into SBO. Check whether the report ID is correct in the user query. Check whether every report parameter is included in the user query. Check whether the report name is correct. 2. Open rpt file in Crystal Reprts designer. Print a preview document and change the connection to the right database. Save the report file. If you had to configure the database connection, import the report to SBO again. Make sure that you modify the report ID in the user query if needed. 3. Check if the report can be printed from SAP Business One. With the advanced printing configurations printing issues caused by incorrect server/database connection settings in Crystal Reports can be solved. The value of BXMPRAO is the sum of the value of the enabled parameters. The default and recommended value is 54. It means that the Settable connection (2), the Set sub reports (4), the Use printer settings (16) and the Use connection clone (32) parameters are enabled (2+4+16+32=54) by default. Do not change the default value. If the issue persists, please contact Produmex support. Settable connection (2): Creates a new connection structure with the actual parameters. Set sub reports (4): Applies the (1) and (2) setting to the sub reports as well. Use printer settings (16): Uses a non-standard access to printer settings. Use connection clone (32): Uses a clone of the connection structure. Settable log on (1): Resets the server/database connection to the actual in the tables of the existing structure. This setting is not taken into account if the Settable connection (2) setting is also enabled. Dissociate size (8): Enables the ‘Dissociate Formatting Page Size and Printer Paper Size’ option. Use setting with name (64): Uses both the standard and non-standard access to the printer settings. Starting from SBO 9.3 PL04, SBO includes a new SAP Crystal Reports runtime engine version 13.0.22 (technical version number 13.0.3500.0). In the past the SAP Crystal Reports runtime engine version 13.0.14 (technical version number 13.0.2000.0.) was used. Produmex Scan will support the new Crystal Reports version from version 18.2. You can check the current SAP Crystal Reports version on Control Panel > All Control Panel Items > Programs and Features. 1. Adjust the app config file of the Service Broker. 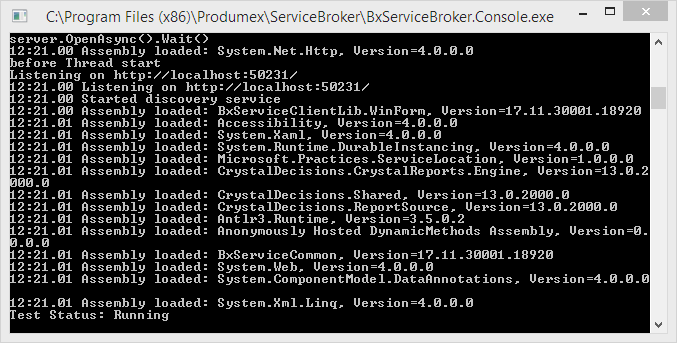 Open the BxServiceBroker.Service.exe.config file from C:\Program Files (x86)\Produmex\ServiceBroker\ with a text editor. Insert the following code after the already existing “dependentAssembly” tags.